At the time of such political and social unrest few could have imagined the cultural effect German immigration would have on northern Mexico. When Germans arrived they brought with them the “button accordion,” as well as popular dances like the polka, mazurka and waltz. After the U.S. Civil War ended, thousands of Germans also immigrated to Texas, joining some German immigrants who had arrived in the 1830s. Mexican and Mexican-American musicians used German immigrants’ accordions to add a European flair to a genre that was already coming together as a mix of a dozen traditional forms and styles. Despite the excitement of decades of cultural cross-pollination, conjunto only truly came into its own in the 1930 when Narciso Martinez stepped up with his accordion. In the ’20s American record companies, trying to replicate the success they’d found marketing African-American music, had begun to support Mexican-American recording artists, pushing songs by their chosen musicians into jukeboxes, onto the radio and into public dance performances. Musicians like Martinez, who became known s “El Huracan del Valle” (“The Hurricane of the Valley”), took this support as a license to experiment. Mexican-Americans had been attending dances by Texan bands such as Bob Wills and His Texas Playboys. They were also submerging themselves in blossoming genres like country, blues, European fiddle music and swing. 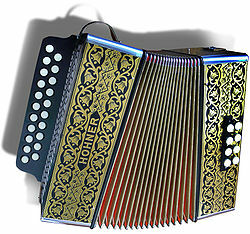 All this musical exploration helped inspire Martinez to depart from traditional German accordion techniques and develop a prancing style that allowed him to focus on creating melodies while his musical partner Santiago Almeida played the bass notes on the bajo sexto. Martinez’s style became a staple of the genre; the cascading accordion defines conjunto music today.